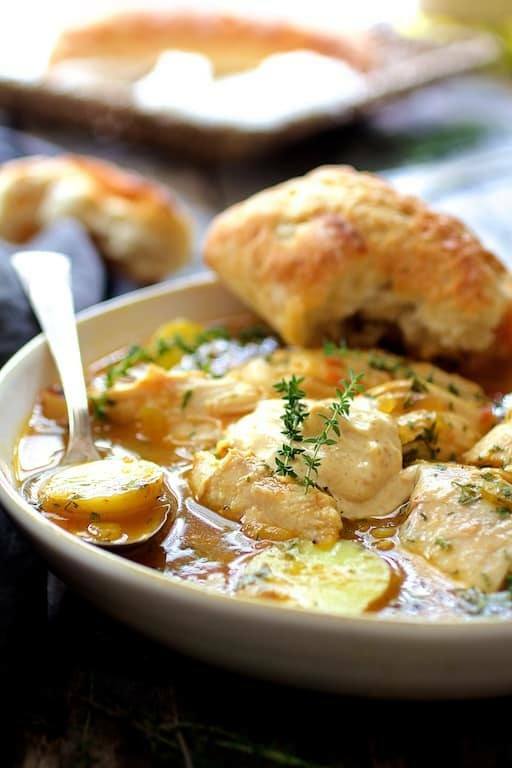 Lush and luxurious, French-inspired Chicken Bouillabaisse is a rustic chicken stew that's elegant enough to serve to guests! CHICKEN: Heat olive oil in a Dutch oven over medium-high heat. Season chicken generously with salt and black pepper. Place in the hot oil, reduce heat to medium and brown well on the skin side, approximately 6-7 minutes. Transfer to a plate. Add the onion, celery and fennel to the oil (adding more if needed) and cook 8-10 minutes or until very soft. Add the tomatoes and garlic and cook 2 minutes. Add the wine, chicken broth, bay leaves, thyme, saffron, orange peel and crushed red pepper flakes. Bring to a boil. Add the potatoes and cook gently 10 more minutes or until potatoes are tender. With a fork, remove skin and shred chicken into large chunks. Place back in broth. Add chopped fresh parsley. ROUILLE: Place saffron threads in a small bowl. Remove 2 tablespoons of the hot cooking liquid and allow saffron to soften a bit. Add remaining ingredients and whisk until smooth. TO SERVE: Serve in shallow bowls with crusty bread, topped with a dollop of the rouille.